Location of Nekoosa in Wood County, Wisconsin. Nekoosa is located at 44°19′09″N 89°54′00″W﻿ / ﻿44.319081°N 89.899937°W﻿ / 44.319081; -89.899937Coordinates: 44°19′09″N 89°54′00″W﻿ / ﻿44.319081°N 89.899937°W﻿ / 44.319081; -89.899937 (44.319081, -89.899937). There were 1,065 households of which 33.1% had children under the age of 18 living with them, 46.4% were married couples living together, 13.4% had a female householder with no husband present, 4.8% had a male householder with no wife present, and 35.4% were non-families. 30.2% of all households were made up of individuals and 15.5% had someone living alone who was 65 years of age or older. The average household size was 2.40 and the average family size was 2.98. The median age in the city was 39.4 years. 26.5% of residents were under the age of 18; 7.9% were between the ages of 18 and 24; 23.8% were from 25 to 44; 23.6% were from 45 to 64; and 18.1% were 65 years of age or older. The gender makeup of the city was 47.8% male and 52.2% female. As of the census of 2000, there were 2,590 people, 987 households, and 702 families residing in the city. The population density was 763.5 people per square mile (295.0/km²). There were 1,063 housing units at an average density of 313.4 per square mile (121.1/km²). The racial makeup of the city was 96.72% White, 0.12% African American, 1.27% Native American, 0.31% Asian, 0.97% from other races, and 0.62% from two or more races. Hispanic or Latino of any race were 1.81% of the population. There were 987 households out of which 36.3% had children under the age of 18 living with them, 55.2% were married couples living together, 12.9% had a female householder with no husband present, and 28.8% were non-families. 24.8% of all households were made up of individuals and 13.3% had someone living alone who was 65 years of age or older. The average household size was 2.55 and the average family size was 3.05. In the city, the population was spread out with 27.6% under the age of 18, 7.8% from 18 to 24, 27.2% from 25 to 44, 20.6% from 45 to 64, and 16.8% who were 65 years of age or older. The median age was 37 years. For every 100 females, there were 88.6 males. For every 100 females age 18 and over, there were 83.5 males. The median income for a household in the city was $39,375, and the median income for a family was $44,583. Males had a median income of $36,308 versus $22,361 for females. The per capita income for the city was $17,063. About 6.7% of families and 9.7% of the population were below the poverty line, including 10.6% of those under age 18 and 12.0% of those age 65 or over. Employment in Nekoosa has long been dominated by paper making. The Nekoosa Paper Company, incorporated in 1893, constructed a mill on the Wisconsin River. In 1908 it merged with a paper company in nearby Port Edwards, forming the Nekoosa Edwards Paper Company, or NEPCO. In 1970 NEPCO merged with the Great Northern Paper Company, forming Great Northern Nekoosa Corporation, or GNN, which was purchased in a hostile takeover by Georgia-Pacific in 1990. In 2001 the mill was sold to Canadian paper company Domtar. The Nekoosa mill was the original home of a cutting-edge paper machine first shown at the 1893 Columbian Exhibition. The machine was moved in 1923 to a sister mill in Port Edwards. Stock certificates from NEPCO and GNN are popular scripophily items. Nekoosa has four schools: Humke Elementary School, Alexander Middle School, Nekoosa High School, and Nekoosa Academy. A new school designed specifically to teach Ho-Chunk heritage and history has been added to the district. ^ "How do I? 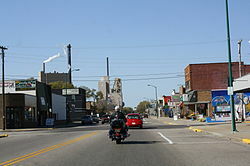 – City of Nekoosa, Wood County, Wisconsin". ^ Rudolph, Robert S. (1970). Wood County Place Names (PDF). The University of Wisconsin Press. p. 56. ^ "A history of the origin of the place names connected with the Chicago & North Western and Chicago, St. Paul, Minneapolis & Omaha railways", page 106, by William H. Stennett, Edition 2, Published 1908, Original from Harvard University, Digitized July 30, 2008 for Google Books, 201 pages. ^ "Locations". Hoocąk Waaziija Haci Language Division, A Division of The Ho-Chunk Nation. Retrieved 2014-04-06. ^ J. Marshall Buehler. The Nekoosa Story: A Commemorative History of Nekoosa Papers Inc., Port Edwards, Wis.: Nekoosa Papers, 1987. 169p. HD 9829 .N45 B84 1987. ^ "Nekoosa seeks buyer to avoid hostile bid", New York Times, February 14, 1990. Wikimedia Commons has media related to Nekoosa, Wisconsin. This page was last edited on 1 April 2019, at 17:11 (UTC).